Heidi and I celebrated our 21th wedding anniversary on Oct. 1st. We had planned to go out for lunch, but with the flood causing problems for so many people we decided to put postpone our lunch date. The kids all reported to clean up crews and spread out helping clean up. I stayed home and worked on appliances which needed to be taken apart and cleaned. 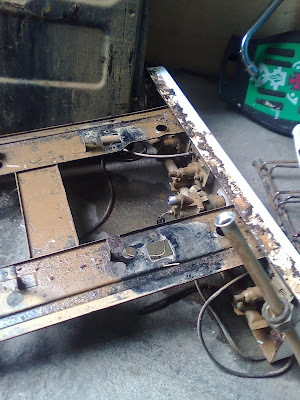 I had to take this stove completely apart and clean everything. I even had to wash out the insulation. Rust was already setting in so several parts needed to be sanded and painted. The most amazing thing happened! I got it back together again. I wonder if all those extra parts I ended up with are important! We haven’t had running water for almost a week now. 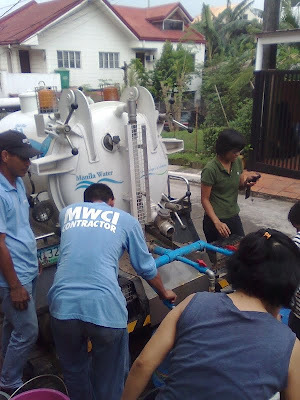 We have been able to get drinking water from the local school and water for bathrooms and laundry from the rain, school, and water truck. Twice trucks have come by and filled up our water barrels. Last night the water started running so I told Heidi that her anniversary gift could be having running water to wash the dishes. You’ll never guess what I got for my anniversary gift… I guess I should have noticed she was holding a frying pan over her head while I was explaining the joys of washing with running water. Happy anniversary! So glad you are all safe and sound... what a devastating flood - your pictures are amazing! And what a blessing you are to your friends and neighbors - all your rescue missions and clean-up help! I hope that you get a chance to celebrate your anniversary when things calm down a bit. Oh My! 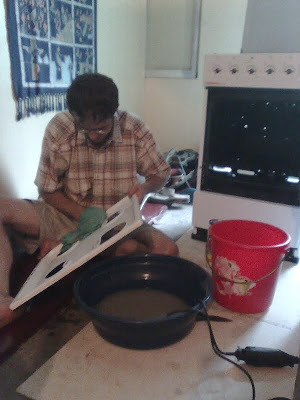 Cleaning sounds like a chore, but how in the world do you clean off all that mud, with no running water! I can't imagine. We thank God that you are all fine. And will be praying for your friends and neighbors, and for this next wave of rain. Thank you for taking the time to post pictures.